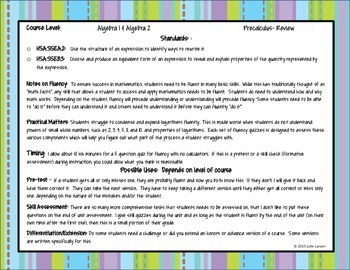 The Common Core State Standards in Math (CCSSM) stress fluency with skills and procedures along with conceptual understanding and mathematical applications. 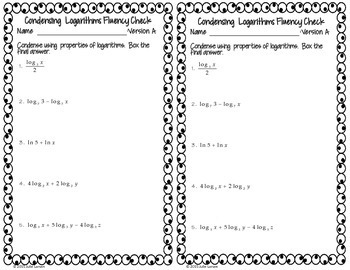 Fluency with mathematics at the secondary level requires the same repeated practice and feedback as multiplication facts did in elementary school, however, generating the required fluency checks takes time. Many middle and high school students still believe that as soon as you take a math test, you can purge the information from your brain. 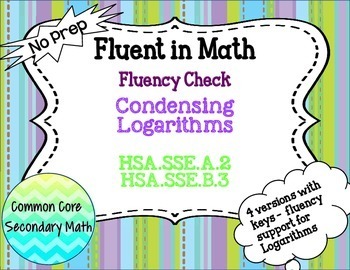 I created these fluency checks because I and my students needed them and I hope they can help you and your students. Students do need to understand how and why math works. Depending on the student, fluency will precede understanding or understanding will precede fluency. Some students need to be able to “do it” before they can understand it and others need to understand it before they can fluently “do it”. Each set of fluency quizzes is designed to assess these various components which will help you figure out what part of the process a student struggles with. 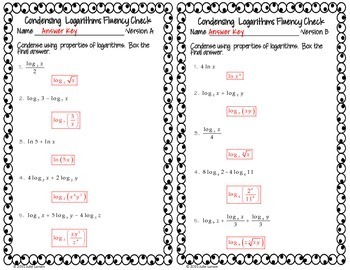 You will receive 4 versions of Condensing Logarithms. Each version has 5 questions and calculators are not needed. Complete answer keys are included.